The Seljuks were Turkic nomads from Turkmenistan. They were related to the Uighurs. They entered the Abbasid empire around 950 AD and gradually converted to Sunni Islam. By 1030 AD the Seljuks were beginning to try to get power for themselves. They soon conquered the Ghaznavids (who were also Turkic) and controlled most of Iran. The Seljuks’ capital was at Isfahan. 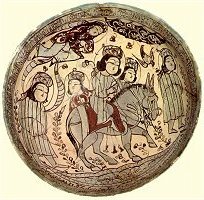 Like the Ghaznavids, the Seljuks spoke Persian and encouraged Iranian culture. And, like the Ghaznavids, they made and sold high quality crucible steel to Viking traders, and to China. By 1055, the Seljuk king Togrul Beg had conquered Iraq too. Although there was still an Abbasid caliph in Baghdad, the caliph pretty much had to do whatever the Seljuk sultan Togrul Beg wanted him to do. When Togrul Beg died in 1063, his nephew Alp Arslan took over. (Alp Arslan means “the hero lion” in Turkish, and it’s where C.S. Lewis got the name of Aslan for the Narnia books ). In the west, Alp Arslan fought to take Syria from the Fatimids and Armenia from the Byzantine empire. In 1070, the Byzantine emperor Romanus IV Diogenes decided to try to push the Seljuks out of Armenia. At first the Byzantines (with some Norman allies) won. Then there was a great battle at Manzikert in 1071, just east of the Euphrates river, but the Byzantines lost. The Seljuks not only won the battle, they also captured the Byzantine emperor Diogenes! In the end, Alp Arslan let Diogenes go in exchange for a lot of gold and the promise that he could have Armenia and a lot of other Byzantine land too. Then they were at peace. Alp Arslan died the next year and his son Malik Shah became sultan. A small group of Saxon refugees from England seem to have taken advantage of Alp Arslan’s death to conquer some land in Crimea, north of the Black Sea, and settle there. After Malik Shah died in 1092, the Seljuks got less powerful, and by 1192 their dynasty ended. The Seljuk empire broke up into many small kingdoms. 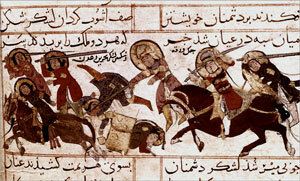 When the Mongol invasions came to West Asia, the Byzantines and the Seljuks fought together against the Mongols. But they lost, and in 1243 the Mongols took over both Iran and Anatolia (modern Turkey), and, with the help of the Crusaders, began to push southward into Syria (where the Mamluks defeated them). After the Mongol Empire collapsed, however, it was one of these Seljuk kings, Osman, who founded the new Ottoman Empire. Cite this page: Carr, K.E. 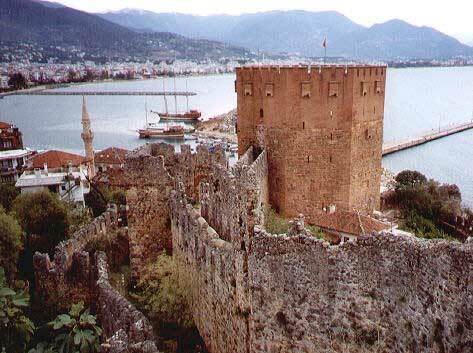 Seljuk Dynasty – Medieval Islamic history. Quatr.us Study Guides, July 25, 2017. Web. April 19, 2019.